Your dog is your best friend. You rely on him for affection and he relies on you to take care of all the details. That’s why you’re looking for a safe and effective way to care for his nails. Our experts researched and reviewed the best dog nail grinders to bring you a top ten list because we know your pooch deserves premium care. Before you start shopping, check out the specifications below to help guide your purchase. Power: Check this spec to find out how many volts are behind each of the grinders on our list. If you have multiple pets to take care of, or just want to get your main squeeze finished in a hurry, you’ll need a good amount of power. Pieces: Extra parts, especially ones like grinders that wear down over time, are a great perk! We’ll let you know how many pieces come in each kit, including grinder heads and tools. Just check this spec for the details. Rechargeable: Never run out of power, when you have a rechargeable battery on hand! If the grinder you like can be zapped back into work, we’ll tell you here. Some of the products on our list take disposable batteries and come charge via USB. Quiet: Those with skittish pets know peace and quiet during potentially stressful times, like nail grinding, make all the difference. If you need a quiet grinder, check here to make sure the model you like won’t generate too much noise. Charging Time: If you choose a grinder with rechargeable batteries, you’ll want to know how long it takes to recharge. Check this spec to find out how long you’ll have to wait between uses, but keep in mind grinding isn’t an everyday activity. Warranty: We’ve included some of the best models on the market, but nothing is foolproof and it’s always nice to have a satisfaction guarantee. Check here to find out if the grinder you’re eyeing comes with a warranty and how long it’s good for. Now that you know what to look for while shopping, you’re ready to check out our dog nail grinder buying guide. Each option on the list was carefully selected, so you can feel confident that you’ll end up with a quality product, no matter which item you choose. If you’re in a hurry, check out our top and budget picks first. Let’s get started! Our favorite professional dog nail grinder is the Dremel Pet Nail Tool. When your pup’s claws start to feel long and scratchy, this rotary unit provides a safe alternative to clipping. Dremel dog nail grinder reviews are usually positive, and our is no exception! Gently sand down sharp nails that can split and become painful or accidentally scratch members of your family. This grinder is compatible with an array of Dremel sanding drums and bands and comes with a 60-bit drum that humanely and quickly trims nails. You’ll be able to customize the experience by choosing between two gentle speeds, both of which perform optimal trimming. Worried about a hyperactive pup? Keep your dog relaxed, by grinding wherever he’s comfortable, thanks to the cordless operation. The Dremel is battery-operated, charges in about three hours and comes with easy-to-follow instructions, so you’ll be taking care of your favorite furry friend’s nails in no time. Skip an extra trip to the groomer and keep your dog happy and healthy from the comfort of your own home. Our budget pick isn’t just affordable, it’s also a quiet dog nail grinder equipped with a diamond-bit grinding stone that reduces the risk of you accidentally clipping too close and hurting your pet! Cheap, safe, and effective: the Hertzko Pet Nail Grinder checks every box on our list! A removable port cover allows you to grind according to dog size with three different size openings. The small and medium openings are perfect for little guys and average-sized pets. The entire cover can be removed to effectively grind larger dogs’ nails. No matter the size of the job, you’ll enjoy a super quiet motor designed to keep your pet calm and allow you to groom his feet, without disturbing everyone in the house. Even better, the motor features low vibration, so Fido will hardly know it’s there. Cleaning is a breeze, thanks to the removable piece over the stone that lets you get into hard-to-reach areas. When it’s time to recharge, simply use the included USB cable and plug into a power source and you’ll be ready for your next session! 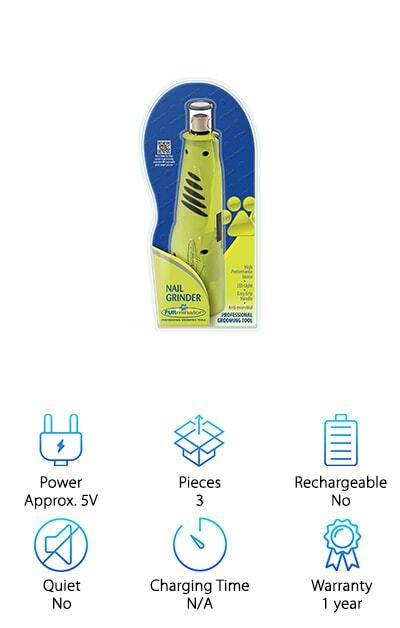 Next on our list of dog nail grinder reviews is URPOWER Pet Nail Grinder. Super quiet, this device features a unique muting technology to keep your dog calm and relaxed. Powerful enough to quickly trim nails, this grinder is ideal for small or medium dogs and features a cover with two different ports to accommodate different sizes. You can also remove the cover completely for faster grinding if you’re confident in your abilities, short on time, and want to move as quickly as possible before your pooch gets antsy. The grinding head itself is made from diamond bits that provide a steady, even, and safe way to shorten claws. Charge URPOWER with the included USB charger. When it’s time to recharge, an indicator light will go on. 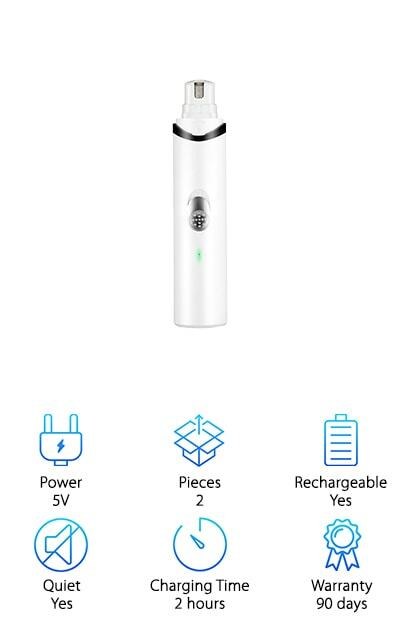 After two hours of charging, you’ll enjoy up to three hours of continuous grinding, which is more than enough time to get the job done! Complete with a 90-day warranty, you’ll have everything you need to treat your little prince or princess to a pedicure! Cut down on costly and time-consuming visits to the grooming salon by taking your pet’s nails into your own hands. The FURminator Nail Grinder allows you to grind down your furry friend’s nails in a safe, efficient, and painless manner. It’s an affordable and easy way to keep your dog comfortable and polished and the best part is you can do it from home. Whether you’re searching for a nail grinder for large dogs or your pup is small, this versatile tool will deliver the results you seek. Equipped with an automatic LED light that ensures safety and keeps you in total control, you won’t have to worry about adjusting the grinder. Simply turn it on and gently grind your pet’s nails down to an appropriate length. FURmintaor is lightweight and easy to use and runs on four AA batteries, so when the power is running low, just them out. Your purchase comes with two replaceable grinding bands to keep you and your pup well-groomed for awhile-- all at a price that won’t break the bank! Keep your pet safe from injury when you choose a dog nail grinder with guard protection. 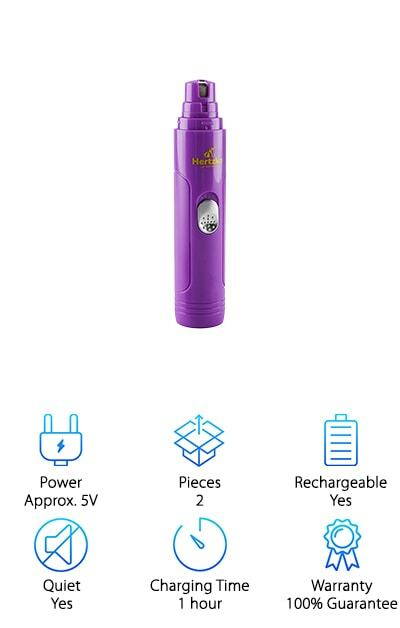 Our next pick is AMIR, a pet nail grinder that is designed to be safe and effective through the use of a plastic cover that allows you to tailor the grinder to the right size for your pup. Remove the cap to expose a larger grinding surface for big dogs. Choose between two ports to accommodate smaller pets. The diamond-bit grinder head reduces the risk of pain from cutting claws too short, by providing an even and steady grinding motion. Even better, this quick, efficient process will go smoothly and quietly, thanks to the muted motor that reduces noise and keeps your dog calm and comfortable throughout the process. A leader in safety and efficiency, AMIR is also convenient and practical. It’s lightweight, comfortable to use, portable, and comes with a plastic cover that prevents nail cuttings from flying around. You’re looking for the best nail file for dogs, but have you considered purchasing a set that has everything you need to give yourself a manicure, too? The MARKARTT is a seven-piece grinder set that includes multiple grinding, filing, and grooming tools. It features two speeds-- one for pets and one for people-- and operates cordlessly on batteries for ultimate convenience. Quiet, lightweight, and compact, your dog might not even realize you’re grinding her nails! And you can switch out the head and speeds to take off your own gel or acrylic polish in a pinch. The ergonomic body makes MARKARTT easy to use and comfortable to hold. An LED light gives this unit style and helps light the way in darker environments. Complete with its own durable carrying case and six sanding bands, this kit is perfect for anyone interested in a multifunctional tool for safe and successful trimming and manicures! The search for the best nail grinder for dogs brings us to the Bonve Pet Dog Nail Grinder next. This durable, reliable grinder features a diamond-bit head for strong, stable, and safe grinding. Choose from two speeds and three different ports to customize the grinding experience specifically to your pet’s needs. Fast and efficient, you’ll love how quickly and easily giving your furry best friend a pedicure can be. The hard emery wheel gently shapes your dog’s nails to the correct length and dullness, keeping the pup and your family safe from scratches and injuries. Low noise and low vibration ensure a calm, soothing environment that won’t upset your dog or bother other people in the house. An ergonomic handle keeps you poised and comfortable while grinding, helping you maintain precision and focus, so you don’t end up hurting yourself or your pet. 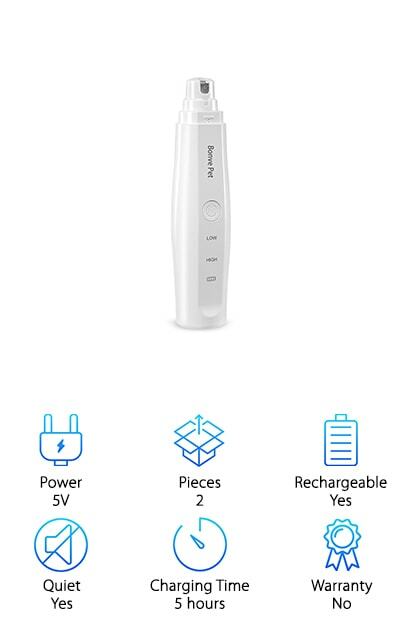 And when it’s time to recharge, simply plug the Bonve into a power outlet via its included USB cord to generate energy for your next grooming session! Sleek, easy to use, and highly effective, the Emitter Pet Nail Grinder is a professional dog nail grinder that works well on pets of any size. 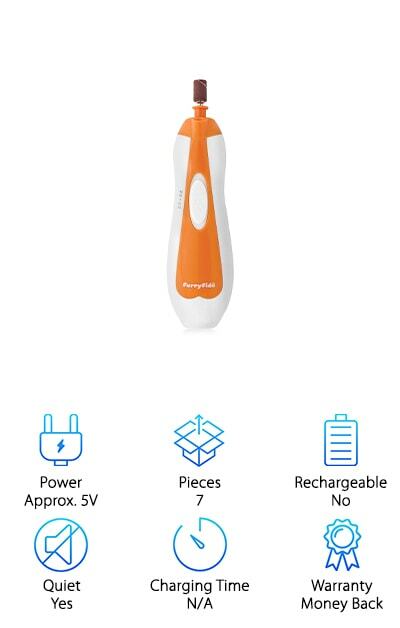 Two different ports on the removable plastic cover allow you to tailor the grinding diameter to your pet’s needs, so whether you have a miniature pup or a massive hound, nail trimming will be a breeze. Designed to be ultra quiet to keep dogs calm and owners unbothered, the Emitter works to prevent anxiety about grooming. Gently shape and dull your dog’s nails, easily remove sharp edges, prevent destruction to your home, and save your furry friend from experiencing painful splitting. The grinder head is made from ultra-durable, hard silicon carbide. It is built to last and get the job done every time. You can easily remove the head to replace it, but you probably won’t have to, because our grinders are made to last a lifetime. Pamper your pup and go easy on your pocket when you choose this effective, affordable device. We’re getting close to the end of our best dog nail grinder reviews, but we’re not done yet. Check out the Enjoy Pet Nail Grinder. Powerful and effective, Enjoy features a strong, fast motor and two speeds: high speed for larger dogs and low speed for smaller dogs. The diamond bit quickly trims, dulls, and shapes nails to achieve the desired length and feel. Remove the plastic cover for a wider grinding area to accommodate big pets or use one of the two ports for small and medium dogs. Although this grinder can handle large paws, it’s super lightweight and small enough to fit in your pocket! Perfect for on-the-go use, you can use the included USB port to charge it in your car or even from your phone, laptop, or tablet! Even better, you can barely hear this grinder, making it perfect for anxious or skittish pets. Eliminate struggling and enjoy up to 2.5 hours of continuous grinding when you choose this low-vibration, low-noise model. Finishing the list strong is our final dog nail grinder review: the Furry Fido Nail Grinder. Trim, shape, and smooth rough or long nails from the comfort of your own home, instead of spending money at a grooming salon. 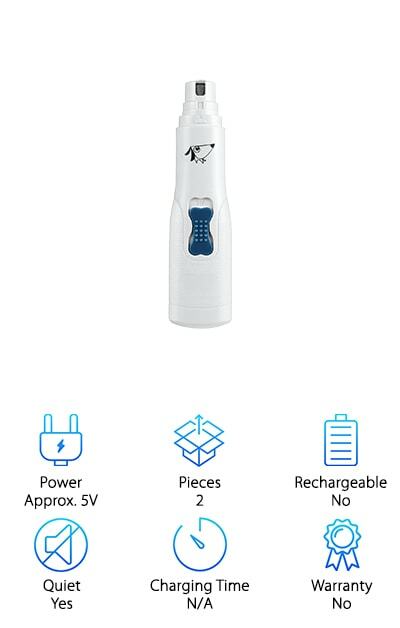 Equipped with two forward speeds and two reverse speeds, you can trim your furry friend’s nails and even give yourself a manicure! This set comes with six different sanding bands ideal for polishing and trimming nails. Gentle and safe, the quiet design works to keep a calm atmosphere, so you won’t find yourself struggling with your pet. 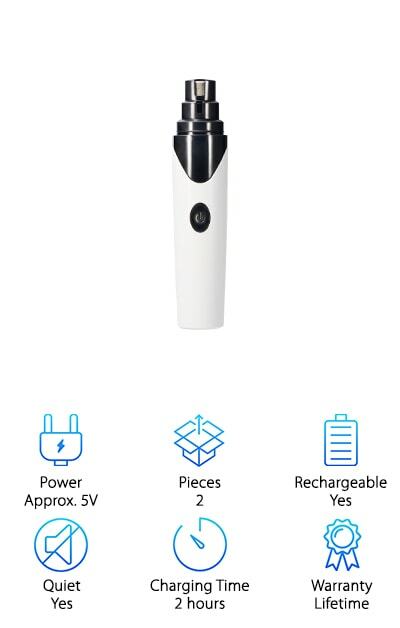 The ergonomic, streamline body fits comfortably in your hand to help you achieve precise results and the entire unit runs on AA batteries, which are easy and simple to replace when the power runs low. Spend more time cuddling with your favorite furry friend and less time worrying about scratches and split nails when you bring home this foolproof, effective nail grinder!